This unit is packed with activities to build early reading and writing skills. There are resources to use with small and whole groups, as well as those to give to independent learners. Take a moment to preview the unit to see all the unit has to offer. Literature and Non-Fiction Text Connections List of recommended fiction and non-fiction texts to use with this unit. Word Bank Display the word cards and pictures for student reference while writing and reading chicken stories. Story Comparisons Chart Compare different versions of The Little Red Hen. 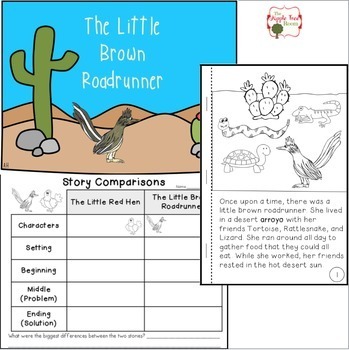 The Little Brown Roadrunner Read-Aloud Book Read this southwestern version of the Little Red Hen and use it in a discussion to compare different versions of the story. Sequencing Cards Use in a center or small group to support sequencing the events in the story. Retelling Story Pieces Use in a center or small group to support retelling different versions of the story. 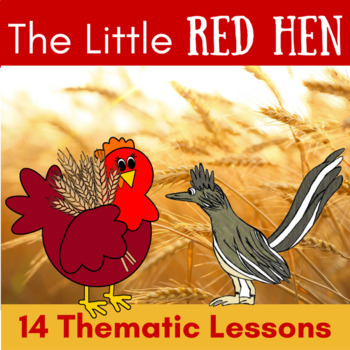 The Little Red Hen Small Group Rebus Read-Aloud Use in a small group setting to support students with decoding and comprehension strategies. The Little Red Hen Booklet for Emergent Reading Cut, assemble, staple and read this emergent reader. The Little Brown Roadrunner Booklet Cut, assemble, staple and read this booklet independently. 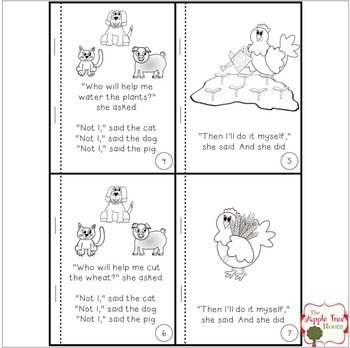 Build-a-Book Story Writing Write versions of The Little Red Hen. 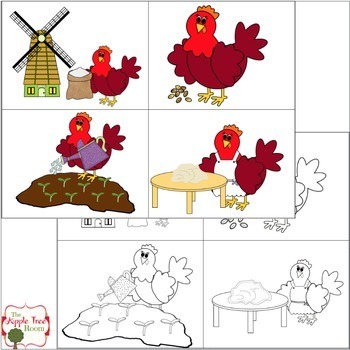 Select characters and a setting, then follow the pattern of the Little Red Hen to retell the story. Opinion Writing Use the writing process (brainstorming, drafting, editing, and final copy) to write their opinion about their favorite version of The Little Red Hen. How-to Informative Writing Use the writing process (brainstorming, drafting, editing, and final copy) to write about how to make something (either food or an object). All About Chickens Informative Writing Use the writing process (brainstorming, drafting, editing, and final copy) to write about an informative paper about chickens. Chicken Life Cycle Center Match life cycle pictures to descriptions. The Chicken and the Eggs Math Center Match numerical representations (tally marks, tens frames, number words and base 10 blocks) to numbers. These activities are aligned with Kindergarten and 1st Grade ELA Common Core Standards, but can easily be used for 2nd grade.